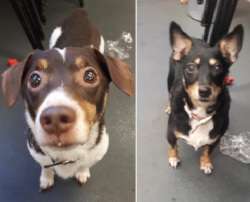 These two little sweethearts are looking for a home together. They are very bonded to each other and to their owners, however this love they have for them is sadly the reason they need to be rehomed. They can’t be left alone at all without getting extremely anxious and upset and as both owners work, this is becoming more challenging. With a baby on the way the difficult decision has been made to try and find them a special home that can provide all the love & attention they need. They do have some medical issues that are not causing problems but will not be insurable, so this should be considered before placing an interest. Great with people, all they need in their retirement years is a comfy lap to snooze on and lots of nice walks… Could you be that extra special person to give them what they need?